The Purple Scarf: Event! : An All-Night Art Party! Last Saturday night was one of my favourite annual Toronto events - Scotiabank Nuit Blanche. I have been going to Nuit Blanche since I moved back to Toronto almost eight years ago and it fast became one my never-miss events. It's an all-night celebration of contemporary art and the Toronto itself - two of my favourite things! Over the years, I have seen some amazing installations and some that just made me scratch my head. I always strive to visit at least ten large installations and if I enjoyed half of them, I call the night a success. I usually see more than ten, stopping along my way at small renegade installations that dot the city's major walkways. I have seen Nuit Blanche grow from its early years. I've seen world renowned artists participate like Ai Weiwei's Forever Bicycles installation and I've seen the crowds get bigger and bigger and drunker. There were two major drawbacks to this year's Nuit Blanche: the drunken young crowd that seem to be taking over and between several areas that were well populated with art installations were vast areas of nothing. Thanks goodness I wore comfortable shoes, as I did a lot of walking. Some of the highlights for me was getting my picture taken the week before and being a part of The Inside Out Project installation at Nathan Phillips Square. Unfortunately due to the rain, the installation was not open. It is one of the extended installations, so I'm hoping it will open this week so I can find my picture. I also enjoyed the dome located at the ROM. It was an amazing film projection installation and I could've spent my whole night inside the dome. I also really enjoyed Black Cloud at The Powerplant Gallery. This installation is extended so I'm looking forward to visiting again and getting a closer look without all the crowds. Overall it was an exciting and exhausting night of amazing free art. And even though it was overcrowded with some very rude and drunk people, I will be returning next year. 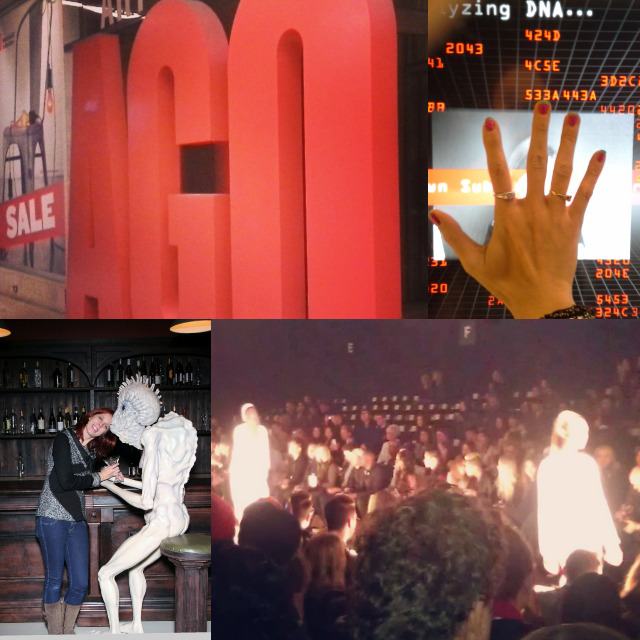 If you want to see more of Nuit Blanche, check out my visits from Nuit Blanche 2014 and Nuit Blanche 2013. P.s! : There are several installations that have extended runs. So if you didn't get a chance to go to Nuit Blanche or missed one of these pieces, there is still time to check them out!